Feb. 15: What's next after Republicans kill Whitmer’s environmental shakeup? Feb. 13: Few love MDEQ. But are oversight panels worth Whitmer-GOP showdown? LANSING — A state Senate Committee on Thursday debated whether to overturn Democratic Gov. Gretchen Whitmer’s executive order to reshape the state’s environmental department — Republicans’ latest maneuver in a power struggle that could derail hopes for bipartisanship early into Michigan’s new era of divided government. The Oversight Committee took no vote on a resolution to rescind Whitmer’s order to morph the Department of Environmental Quality (DEQ) into the Department of Environment, Great Lakes, and Energy (EGLE). Hearings will continue next week, said Chairman Ed McBroom, R-Vulcan. But Republicans on the committee voiced clear displeasure, even anger, at Whitmer’s order — mostly because it would eliminate business-friendly oversight panels that GOP lawmakers created last year. The debate comes one day after Rep. Jim Lower, R-Cedar Lake, filed the resolution in the House, which lawmakers cleared along party lines in a whirlwind of activity. To override Whitmer’s order, majorities in both GOP-controlled chambers must approve the resolution within 60 days. Such a move would be incredibly rare; The last such move was under Republican Gov. William Milliken in 1977. 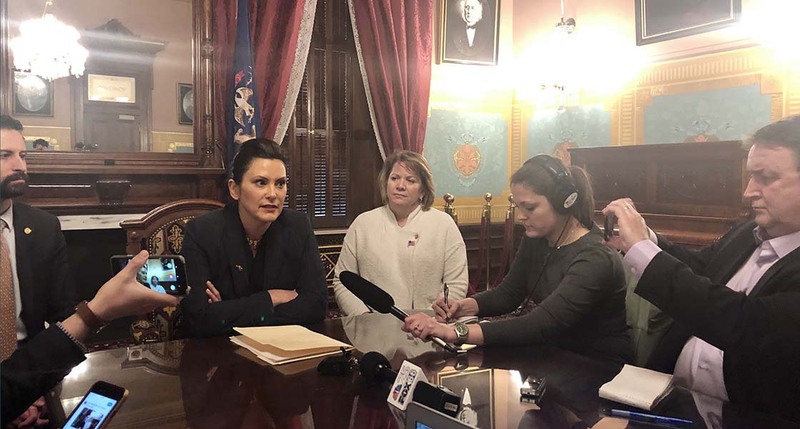 Republicans called Whitmer’s maneuver to eliminate the panels a de facto veto of bills the Legislature adopted last year under Whitmer’s predecessor, Rick Snyder. They argue that such boards — backed by powerful groups such as the Michigan Chamber of Commerce — bolster transparency and check the environmental agency’s power, which Republicans and business interests complain can be overzealous. Democrats say Whitmer is simply using her executive power to reorganize government as she sees fit, and they point out that former Gov. John Engler, a Republican, consolidated his power in 1991 by disbanding a litany of citizens boards that oversaw environmental matters. To restore the citizen panels in dispute, Republicans must override Whitmer’s entire order, with includes the transformation of DEQ, which is why Democrats are bringing attention to all that would be lost if her order was reversed. Indeed, Whitmer has cast Republicans’ ire over the panels as a GOP effort against clean water. Sen. Jeff Irwin, D-Ann Arbor, said he favors citizens panels to watch over the state’s environmental agency — but not the ones created by Republicans last year, which he says are loaded with industry interests. Former Sen. Tom Casperson, who sponsored the legislation last year and now works for McBroom, testified that the panels protected the “little guy” from being steamrolled by government's heavy hand when trying to build on or otherwise use their own public property. “It’s children in Detroit that are getting asthma from breathing dirty air, it's people who are...having their cancer risk elevated by drinking dirty water,” he said. The saga equally involves issues of policy and power, and it began Monday. That’s when Whitmer announced the reorganized department. The public advocates would accept, investigate and analyze complaints related to drinking water and environmental justice problems, and work within state government to address them. The new department would also house an interagency team — composed of agency directors across state government — to draw fix policies that disproportionately pollute low-income and minority communities from power plants and factories. But Whitmer’s order, which takes effect April 7, would also abolish the GOP-created boards, angering legislative leaders. The nixed oversight boards include the Environmental Rules Review Commission. The board has power to “oversee all rulemaking of the Department of Environmental Quality,” and former Gov. Rick Snyder appointed its 12 voting members last year. If the agency’s director and the board stalemate, the director can seek a final ruling from the governor. But critics say the board could halt resolutions by taking them up and never acting — therefore never kicking a decision to Whitmer. Currently, the board has some representation from the environmental and conservation interests: Nature Conservancy and Michigan Environmental Council. A Calhoun County Public Health Department official also sits on the board. But industry interests take up most of the seats, including representatives from the Farm Bureau, General Motors, Waste Management, the Michigan Oil and Gas Association, DTE Energy, a dry cleaning business and an international business law firm. The Legislature created a separate Environmental Permit Review Commission to resolve permitting disputes at the agency. Aggrieved parties trying to, for instance, alter floodplains, drill for oil, mine minerals — or do most anything requiring regulator’s permission — could seek relief. It does not require members to come from particular professions. But environmentalists dub the boards “polluter panels,” arguing they would defang an agency that already has lost teeth due to years of crunched budgets and prioritization of economic development over environmental protection. Republicans and industry backers counter that the boards would bring more accountability to an agency. The panels have only met twice, Whitmer said, and have yet take action on a rule or permit. Whitmer says she won’t back down, even as some Republicans say they’d back a nearly identical executive order that would restore the review panels. “I’m not withdrawing the executive order. I stand by it. It is the best policy to clean up drinking water,” she said Wednesday. This paragraph seems to have extra or missing words: The new department would also house an interagency team — composed of agency directors across state government — to draw fix policies that disproportionately pollute low-income and minority communities from power plants and factories.